Jig-A-Loo - invisible silicone-based lubricant and water-repellent! the properties of a water-repellent ! Performa PTFE is an ultra-dry lubricant with polytetrafluoroethylene (ptfe) with superior adhesion, displaces moisture and instantly lubricates where wet lubricants cannot be used. Graphite Extreme is a serious, fast drying, ultra-thin high performance graphite-based lubricant that can be used in extreme temperatures from -50°C to 550°C. Super Grease is a heavy duty, high performance white lithium grease. It won't melt, run, wash off or freeze. It's perfect for the DIY or industrial use. Lubri Penetra is a super concentrated, super penetrating oil-based lubricant with antifriction treatment. Perfect for protecting the moving parts on all your tools and mechanisms ! Jig-A-Clean is very handy for a quick and easy cleanup. 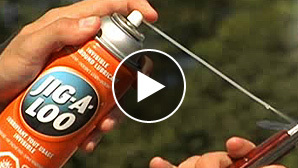 Keep a can in your car, in the garage, in your back pack and get rid of the dirt in seconds !